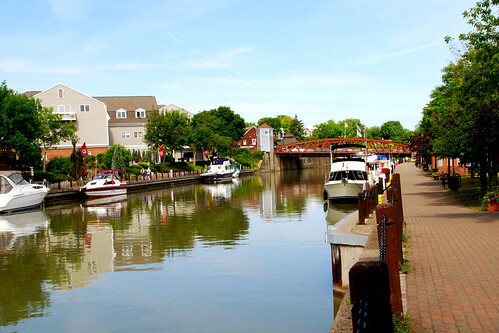 As longtime readers of Beyond Green may remember, I wrote about the increasing popularity of shipping goods along the Erie Canal back in November 2008. Barges use just over a quarter as much diesel fuel as a semitruck in moving a ton of freight. If only 30 percent of the freight that currently goes by truck went by barge instead, it would result in a reduction in diesel fuel consumption of roughly 4.7 billion gallons. This is equivalent to conserving more than 6 percent of the total end-use energy consumed by U.S. households, including heating, cooling, and lighting. To put it another way, the energy savings would be equivalent to turning off every household appliance in the state of Texas. Yet no one would have to do so much as turn down the air conditioner, ride a bike, or even install a fluorescent bulb. It gets better. A rebirth of domestic water transportation would roll back the nation’s reliance on trucks, the fastest growing source of U.S. greenhouse gas emissions. That’s in addition to many incidental benefits, from boosting the Navy’s sealift capacity to improving rescue efforts for disasters like Hurricane Katrina and the earthquake in Haiti. Moreover, by getting containers off trucks and onto a marine highway, it promises to make driving safer and faster for the rest of us, while also significantly reducing the need for highway repairs and new road construction. I get excited about this stuff and then remember that the structural impediments to this kind of dead obvious reform are still too great to overcome. This is all about taking advantage of our natural and built-environment of waterways to rethink our approach to moving things around. And yet, we just get more roads. Still, Transportation Secretary Ray LaHood -- ironically for a GOPer he comes off as one of the most progressive members of the Obama cabinet as far as policy positions go -- recently unveiled DOT's "Marine Highway Initiative" with a handful of stimulus dollars. But it will take a bit more than that to bring shipping back. Perhaps some enterprising and ambitious legislators will take up the challenge? Do we have any of those left, I wonder? Obama to Mississippi River: Get Ready to Rumble!